Nineteen Michigan radio stations this week each gave up a minute of valuable morning drive time to save a bunch of babies from lifelong disability or death. If you are a broadcaster, you can do the same, too. The stations serving the Grand Rapids market aired a simultaneous public-service spot to alert listeners to the dangers of shaking a baby, a momentary act of frustration that is fatal 25% of the times it happens. The non-profit National Center on Shaken Baby Syndrome estimates that as many as 1,400 shaken babies are injured a year, with up to 430 of them dying from their injuries. Children who survive shaking face an 80% chance of lifelong complications including blindness; hearing impairment; cerebral palsy; seizures, and speech and learning disabilities. The Michigan broadcasters were persuaded to run the roadblock after learning of the success of a similar effort in Milwaukee from Dr. Danielle Spilotro, a talented and dedicated pediatrician at DeVos Children’s Hospital in Grand Rapids who also happens to be my niece. After the radio roadblock in Milwaukee in 2001, no cases of Shaken Baby Syndrome were reported for three months. In Grand Rapids, a smaller market than Milwaukee, the hospitals saw four cases of Shaken Baby Syndrome in 2006 and eight cases so far this year. Broadcasters interested in replicating this successful campaign can acquire the media kit and the audio CD here for $60. Sixty bucks and sixty seconds of airtime aren’t much to spend to save a lot of innocent lives. The jumbo online revenue gains at Yahoo’s newspaper partners may be transitory and short-lived, say publishers struggling to sustain initial lifts they fear they can’t replicate in the second year of the agreement. While online sales increased in the neighborhood of 50% for some publishers who began cross-selling Yahoo’s HotJobs along with their traditional recruitment products, executives on the eve of the one-year anniversary of the partnership say it will be difficult in the second 12 months to equal its first-year success. The Yahoo newspaper consortium, which launched in November, 2006, was forged by Belo, Cox, Scripps, Hearst, Journal Register, Lee Enterprises and MediaNews Group. Although publishers hailed the deal at the time as “transformational,” executives now are worried about maintaining the encouraging early momentum. If this experience proves to be commonplace, it would throw cold water on the idea that hefty, double-digit advances in online sales in the next few years could help Yahoo’s newspaper partners offset an appreciable portion of their declining print revenues. As previously reported here, one Wall Street analyst hypothesized that the newspapers teaming with Yahoo could boost their online sales by a large enough amount to achieve positive over-all sales gains as soon as 2009. Paul Ginocchio, the Deutsche Bank analyst, premised his forecast on newspapers being able grow online sales by no less than 40% annually for a period of three straight years. While year-to-date online ad sales at a publisher like Lee Enterprises are 56% stronger in 2007 than they were prior to the HotJobs deal, some executives are worried that the year-to-year numbers after the first anniversary won’t grow at anything close to the original pace. Industry-wide, print newspaper classified revenue fell nearly 16.5% in the half of this year to $1.97 billion, according to the Newspaper Association of America. Although the NAA does not report online revenues by category, total newspaper online revenues gained 20.3% in the first six months. In the same period, Monster.Com, the leading independent online job site, reported a 22% gain in sales. Even though Monster seems to be growing at a respectable clip, online newspaper sales can’t help but be dragged down by the eroding print side of the business, which historically was the reason help-wanted advertisers came to the newspaper in the first place. If advertisers are migrating to online vs. print recruitment, it doesn’t necessarily follow that they will stick with newspapers, especially since Monster often is cheaper than newspapers and Craig’s List is free in all but a handful of major markets where its top price for a help-wanted ad is $75. In addition to the above challenges, newspapers face two additional hurdles in their pursuit of back-to-back years of 40% or 50% gains in their online-recruitment sales. First, newspapers entering the second year of the Yahoo partnership won’t have the one-time infusion of new revenues they got when they initially added HotJobs to their existing recruitment efforts. A restaurant serving only lunch and dinner can boost its sales quite a bit by opening for breakfast. But it can’t add other meals in the second, third and fourth years to match the first-year bonanza. Second, help-wanted advertising seems to be declining in concert with a real, or perceived, slowdown in the economy. Employers are thinning their payrolls in response to tighter credit, the housing slump and a feared pullback in consumer spending. In fairness, there’s more to the Yahoo partnership than HotJobs. The venture also includes mutual cooperation in the sale of national, local and search advertising. While some of those products already are reflected in the improved online numbers for newspapers, it is likely they can be developed further. At the moment, however, HotJobs is the major factor driving the Yahoo revenue surge. And the outlook for that vertical isn’t auspicious. “We think recruitment advertising will slow further, even if the economy avoids a recession in 2008,” says John Janedis of Wachovia Bank. So, publishers counting on Yahoo to rescue them may want to consider some alternative juju, too. There could be two reasons advertising expenditures for the major media declined in the first half of this year for the first time since the tech bubble burst in 2001. Or, maybe three. One cause could be that advertisers, fearing a weak economy, are cutting back on expenditures to sustain their bottom lines. The other is that advertisers are funneling more dollars into non-traditional media. And the third possibility – the one I favor – is both of the above. Ad outlays slipped by 0.3% to $72.6 billion in the first six months of 2007 from the same period a year ago, according to TNS Media Intelligence, a company that tries to sleuth out where marketers, who don’t necessarily want people knowing what they're doing, spend their dough. The sales drop was not spread equally among the media. As you will see from the graph below, the period was kind to such media as the Internet (+17.7%), business magazines (+6.7%), outdoor (+3.9%) and cable TV (+2.8%). 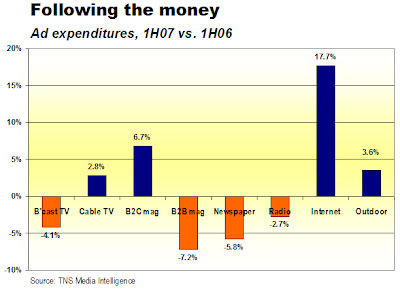 The shortfalls were suffered by consumer magazines (–7.2%), newspapers (–5.8%), broadcast TV (–4.1%) and radio (–2.7%). Instead of buying commercials and print ads, reports Jeremy, brewers nowadays are paying for product placement in entertainment programming (not measured by TNS-type services) and sponsoring promotional events like a bar “Olympics” in Chicago. If you work at a mainstream media company and happen to believe, like me, that brewers aren’t the only ones forsaking the MSM for non-traditional ways to connect with customers, then you ought to start thinking about how you can help marketers engage creatively with consumers in your market. Maybe it’s in print or on the air. But maybe it’s in a saloon.